Esad Ribic has taken on the task of drawing Thor with gusto. He pencils a classic handsome muscly looking hero and the book is consistently well drawn and beautifully coloured. This particular page hits you suddenly and fills you with fear as it does Thor himself. The scene is scary because it is dark and there are many dead bodies lying dead, or horrifically hanging. The figures pictured are enormous compared to our protagonist who is dwarfed by them. They look terrible as their hanging postures are perfect and depict helplessness whilst making us imagine who could possibly place people that large on the meat hooks. The narrative at this point highlights that these creatures as ancient Gods once thought lost but now clearly murdered. The missing body parts and the expressions on the faces of characters on the floor heighten the already quite frightening enemy at hand. Thor’s pose is ready for action but also a little pensive, and taken aback as he surveys the scene in front of him. 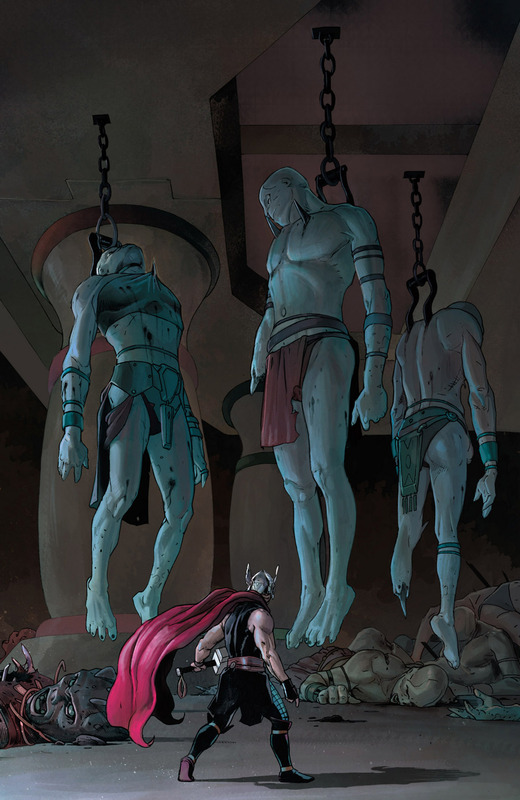 The brutality of murdered giant Gods instils grief into the reader which allows us to empathise us with Thor. This is the purpose of writing and it is portrayed well in the art, what more could be asked of the artist? Esad Ribic is fantastic! I love his art. Thanks you for your comments Jess!